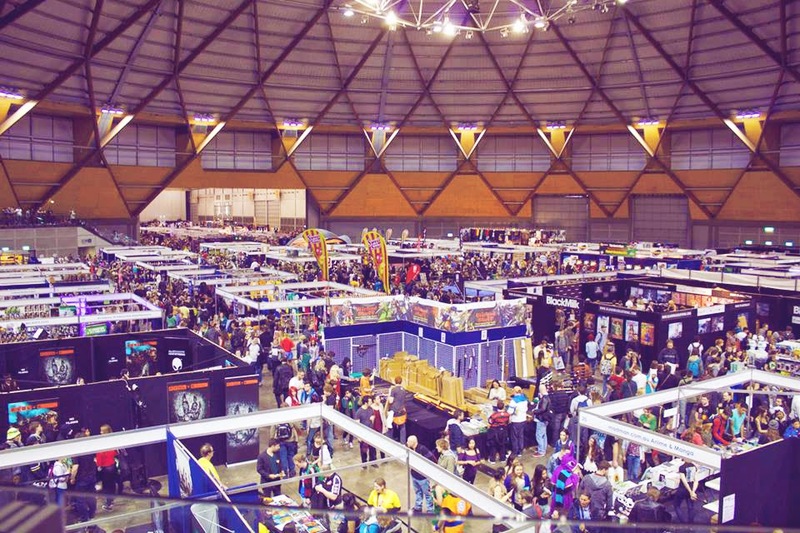 This past weekend Sam and I took a short and sweet trip to Sydney to celebrate our two year anniversary (we've decided to make it an annual thing) and while we were there we spent a day at Supanova, which is a pop culture convention that is held in most of the Australian capital cities throughout the year. It was the first con that either of us had attended, and we definitely didn't start small - it was insane! I though that because we were going on the last day it would be a little bit quieter, but nope, you could barely move the crowd was so huge! I decided to venture out as a girl gang variation of one of my favourite characters, Fionna the Human from Adventure Time. 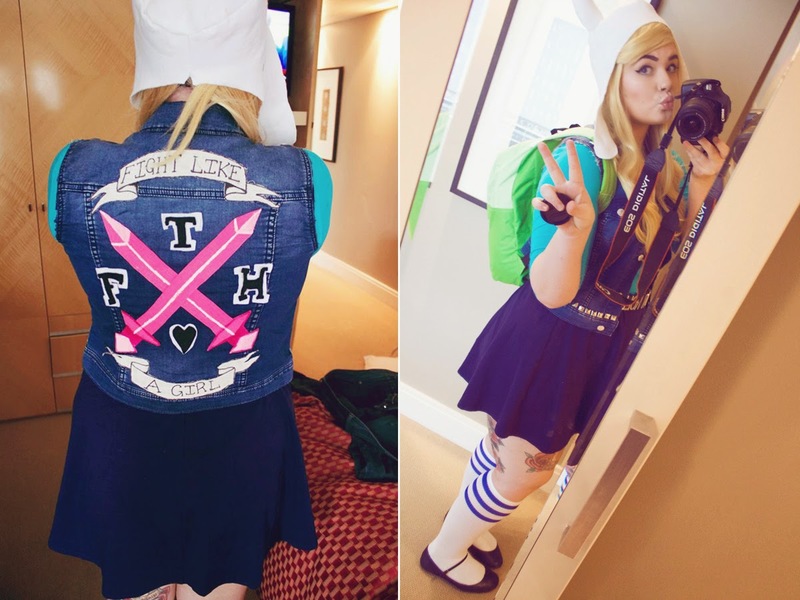 Even though my backpack spent most of the day obscuring my vest, I'm so proud of it, I wish I'd gotten better photos because there was some really cool details - including my Rock N Roll belt and the Cake patch on one of the front pockets of the vest. I've no doubt I'll wear this again sometime soon though, so I'll be sure to add some more neat deets and share them! 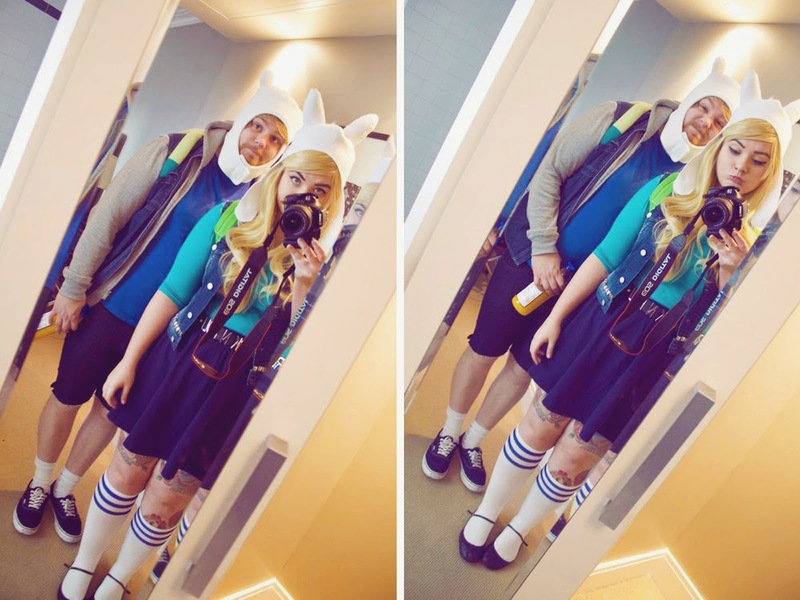 Sam dressed as grown up/beard Finn the Human (if you're not familiar with AT, Fionna is Finn's genderbent, alternate universe counterpart, but I'm sure you knew that!) and he looked so great! One woman walked past us and commented "I didn't know Finn had a tattoo" and I think it embarrassed him a little but I tried to save it by saying we'd gone off the rails, haha. 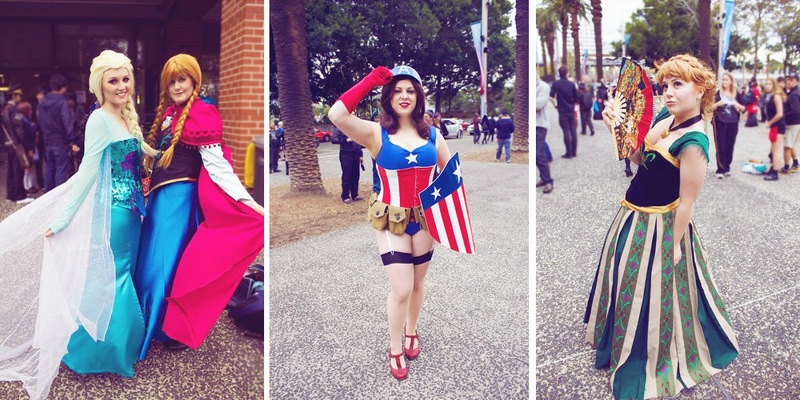 I didn't get to take as many photos as I would have liked because I was just so overwhelmed by all of the amazing cosplays and how many things there were to look at, but these four ladies were definitely standouts for me! Unfortunately I don't know who any of the Frozen cosplayers are, but Captain America kindly gave me her card that identified her as Shi Tenshi Cosplay, so check her out! They were all very kind to let me take their photos, so I hope that they stumble across them somehow. My first con experience was definitely a wonderful, albeit exhausting one, and I've already started working on a cosplay for Avcon here in Adelaide in July, stay tuned! Oh and I've decided to change the alignment of my posts, so if it looks a bit whack, that's why. I'm also trying to work out some kinks in my blog design, but Blogger is proving very difficult to work with, so if things go a bit haywire please bear with me!